Enriching UI for next generation IoT design. 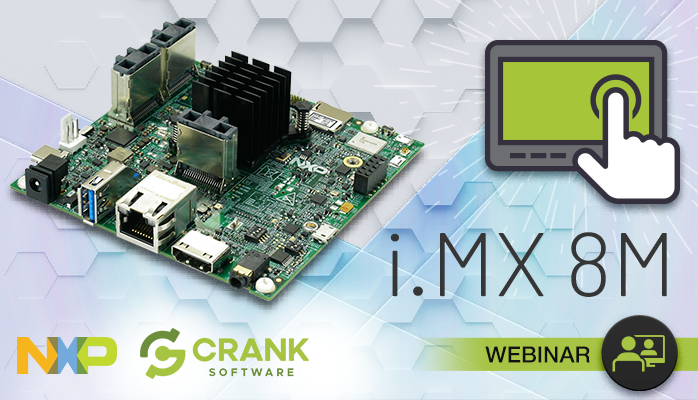 In this webinar, NXP and Crank Software will cover high-speed connectivity, processing throughput, and creating scalable, design-centric user interfaces for the i.MX 8M applications processor. The way we interact with electronic devices has changed. The evolution of consumer devices, such as smartphones, has increased the expectations for user interface aesthetics, connectivity, and innovation for all electronic products. Creating a modern UI design that incorporates high-resolution video and 3D graphics requires a dynamic and high-performing applications processor and rich UI development framework. You will learn about the i.MX 8M applications processor and how easy it is to develop user experiences that exceed customer expectations with Storyboard.